GOODFUNDSADVISOR: ICICI RIGHT FUND - RIGHT OR WRONG?? ICICI RIGHT FUND - RIGHT OR WRONG?? ICICI Prudential Right Fund is a 10 year Close Ended ELSS (Tax Saving ) Fund. The Fund closed for subscription on 09 September. I sent the following advise on the Fund to my clients. 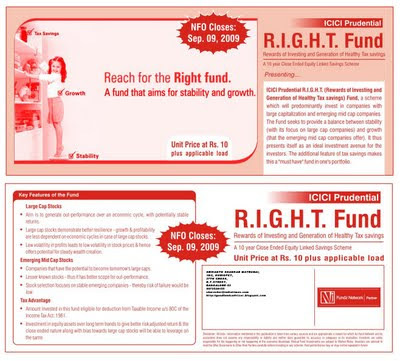 ICICI Prudential Mutual Fund has lauched a New Fund ICICI Prudential Right Fund. The Fund is a 10 year Close ended ELSS that seeks to generate Long Term Capital Appreciaton. The Minimum Subscription is Rs.500 and in multiples of Rs.500 thereof. The scheme will charge an entry Load of 2.25%. What is this RIGHT Fund?. RIGHT is an acronym for 'Rewards of Investing and Generation of Healthy Tax Savings'. The Fund seeks to invest a major part of its portfolio in Large Caps and is thus is 'Safer' compared to other ELSS funds. This is especially more pronounced when you consider that almost all Tax Saving Funds invest in 'Growth' Stocks which are mostly Mid-caps and thus volatile. 1. With its Large Cap Focus, the Fund will have reduced volatilty. 2. Most Tax Funds have consistently delivered Better returns than both Nifty and Sensex. 3. The Fund aims to invest 85% in Top 100 Companies by Market Cap which should protect the Fund during Bear Markets. 4. Minimum Investment is only Rs.500. 1. Since the Fund aims to invest mostly in Large Caps, the fund may fail to deliver superior returns during market rallies. 2. The Fund has an entry load of 2.25%. 3. Being a Close-ended Fund, you cannot take the 'SIP' route to investing in this fund. If you are investing purely for Tax Saving purpose, then you need not look at this Fund. However, if you are looking both for Tax Saving as well as Long Term investment, then this Fund should be in your portfolio.